"Realize Your Dream!" This photo was taken at Alphabet City in 2003 using a point-and-shoot camera. 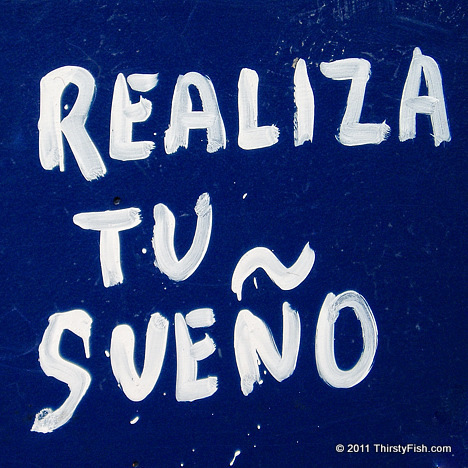 "Realiza Tu Sueno" or "Become Your Dream" tags can still be be spotted throughout NYC. They are the work of a well known New York City street artist, James De La Vega. You can see more of De La Vega's work on Google Images. A dream, in this context, is an aspiration, a goal, an aim - an image in the mind. Imagination is the ability of forming mental images, sensations and concepts. Albert Einstein has said, "Imagination ... is more important than knowledge. Knowledge is limited. Imagination encircles the world". Not everyone can realize all of their dreams. Some "dreams" are simply nonsensical. On the other hand, not every dream is a pipe dream. The biggest hindrance to realizing ones dreams is conformity - acting in accordance to what is perceived to be normal of society or social group. Most accomplished people have realized their dreams because their imaginations were much greater than the society that they belonged to. If your dreams are limited to elevating your social status, chances are you will be disappointed. Dream real, dream big, work hard! Conformity is harmful to mental health. It also stifles genius and creativity. More James De La Vega.